is clearly the real deal." Enlightening and delighting customers is most important to us. By teaching them about the intricacies of your product through high quality wine and spirits tastings, we build brand awareness and customer loyalty. Every Brand Has A Story. We Share Yours. An informative, high-impact tasting with an abundance of customers consistently results in above average sales. Summit Wine Tastings has been refining this approach across the country since 2010. We have our methodology perfected, and educating the customer is at the center of our tasting experience. At Summit, we continuously strive to get your product into the homes of as many shoppers as possible, turning them into faithful, lifelong customers. We wholly comprehend that once a customer has that unforgettable experience with their families and friends — centered around your product — name and brand recognition will reach new highs. If we are unable to convert a customer on-the-spot, we encourage them to snap pictures of your labels for a future in-store purchase. Eric Henry is a Certified Specialist of Wine who draws upon over twenty years of teaching, advertising, and management experience. As a result, Eric sees many parallels between education and marketing. For instance, all successful teachers and marketers break through the clutter and make connections with their audience. In the wine aisle, this means providing a friendly, relaxing wine experience that informs and delights shoppers. 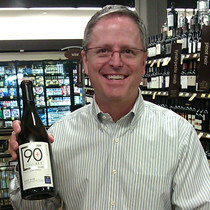 Eric's unique career path has enabled him to develop an approach to wine tastings that educates and delights the consumer, resulting in consistently strong sales for our customers' brands. "With all the companies across the United States vying for our marketing budget, Summit Wine Tastings has proven to be the most effective partner we have found. The sincere and true intentions of its. "As a small wine company, we were doing all of our own tastings and were worried that we weren’t big enough yet to use a tasting service mostly concerned about costs. After hiring Summit,. "There are several obstacles that would have prevented me from ever using a tasting company: price, dependability, and results (or lack thereof). I found that Summit’s service was very dependable, and measurable results were. Building Brands One Sip at a Time® | Established 2010.